Hey Martian Maniacs!! It has been a while, but we are finally Returning from the Void. On April 6th we are playing a stacked lineup for the awesome Gravitoyd’s 2nd Anniversary & Damon’s 52nd dang birthday! 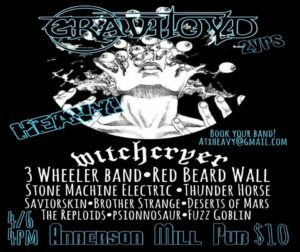 We hope to see you there at Anderson Mill Pub. It’s a day full of friends and future friends so show up early and stay late, because it will be a RAGER!!! So, if you haven’t been following on our Facebook page, we are now joined by Bradley Barnes on guitar (formerly of the doomy downtuned Cesare’). Deserts of Mars were on their way to rockin the universe as a 2 piece when Bradley rocketed to the Mars Base bringing his own brand of axe slinging propulsion to the DoM UFO. His enthusiasm and influences were just what we needed to kick this into overdrive and slay some more Rocktopi. So we took a step back to let the dust settle, kick the rust off some older tunes, and write some new ones so his axe could slice the galaxies. On April 6th you can hear this new sound, new energy and new tunes for yourself. We plan on following this up with more Mars Metal across Earth and beyond as well as planning a new EP to share with the Universe. We hope you join us for this new era in Mars Metal, as we Raise the Pyramids and sing the music of the spheres. Deserts of Mars // Send More Gasoline from yukohfilms on Vimeo. Hey Martian Maniacs!! It has been a while and we wanted give you and update on the state of Mars Metal. This past year or so has been akin to a mashup of “The Martian” and “Spinal Tap” mixed with a bit of “Apollo 13”. Never fear, Morgan and I have been writing as a 2 piece and while the sound is shaping to be a bit different than the DoM of the past, it is still always going to be Mars Metal – (Heavy, spacey, groovey, growly, and melodic, the only way we know how). The riffs are flowing at the Mars homebase and we can’t wait to unleash them at new shows once the Mars Metal has been forged into sonic steel. In the meantime, we have some awesome shows coming up including a show celebrating Tony’s birthday on February 20th. With Grail, Deguello, and Bellringer. 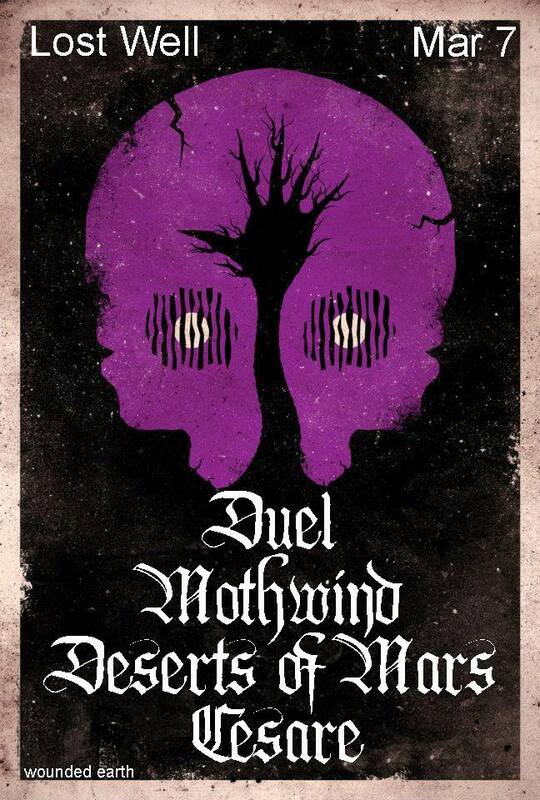 After that we get to play with our friends in Cesare,and Duel, and we welcome Mothwind on https://www.facebook.com/events/405448256283009/?ref=70. Thanks to Dusty Brooks and Wounded Earth Booking. TONS of heavy bands in an all-day riff fueled extravaganza!!! We hope to see you out and about for some Mars Metal! Now that DoM is in full swing, we’re hitting it HARD! Writing new tunes and getting to play show with heavy friends all over! First off we have an impromptu show at Red Eyed Fly on January 17th. It’s an early 8:30 show, but show up early because they start ON TIME!! We’re sad that it’s the end of an era for REF and our good friend Mike Boudreau is moving on to other endeavors. Red Eyed Fly was our first home away from the Red Planet and we are glad to be there to Rock it out in style. On January 31st we are playing with our friends Final Drive on their No Exit Tour. If you haven’t checked out their new album, you need to do this ASAP! Heaviness will be brought, and there might even be a new tune in the mix…..
On Feb. 20th we celebrating Tony’s Birthday a little early at The Lost Well with our heavy friends Deguello (and more TBA). This one is sure to rule!! 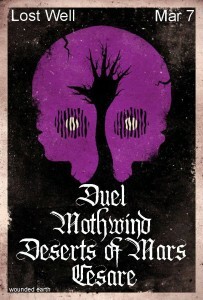 Thanks to Dusty at Wounded Earth Booking!!! This one is going RAGE!! We’ll see you at a Mars Metal show in the near future!!! Hey Martian Maniacs! CDBaby is having a 1 cent shipping deal on physical CDs from the 1st to 3rd, so you can pick up a copy of Transmission and get all the cool artwork and such for our low holiday price of $5 AND get it shipped for super cheap! We also offer a discount on buying multiple copies, so there’s no excuse not to spread the rock this holiday season! Thanks again for all of your support and for welcoming our new lineup at our show at the Lost Well! We have some cool things in the works, so spread the word and crank the Mars Metal! !